These attacks are coming largely from China and Russia. Three aircraft crash, killing hundreds, and U.S. air traffic is paralyzed, leading to canceled travel plans that ultimately cost more than 100,000 American jobs. Already Homeland Security planners are worrying about terrorists and adversaries seeking to attack the United States — not with bombs and guns but with sophisticated computer tactics that could send America back to the dark ages. In one scenario, enemies of the United States use computer savvy to drain $5.5 trillion from American financial accounts in three hours, plunging the country into another Great Depression that could last decades. Such accounts are not mere fictional yarns, spun to entertain. 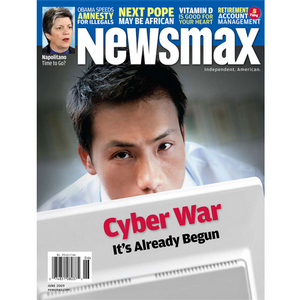 Indeed, Newsmax magazine's special report "Cyber War: It's Already Begun!" is out, revealing that U.S. government officials admit that the incredible attack on U.S. financial accounts actually was attempted — and thwarted. With international computer espionage and cyberattacks at an all-time high, renowned futurist and former White House adviser Dr. Marvin J. Cetron shares his disturbing vision of America's technology vulnerabilities, and details what every American needs to know about the looming threat. Futurist Cetron has incredible credentials. In 1994, as a consultant for the Department of Defense, he warned in a written report that terrorists were planning to use commercial aircraft as guided bombs to strike major landmarks. Now, he is issuing new warnings about cyber warriors. They can delete or alter computers records, copy secret files, create fraudulent documents, steal corporate secrets — but worse, they have the potential to produce disasters that could be staggering, killing tens of thousands or worse. These threats are not imaginary. The first skirmishes in this hi-tech war already are being fought. Hackers can sabotage electronic voting machines in the U.S.
And most importantly, how you can protect yourself from cyberattacks and terrorism! In addition to hard-hitting investigative reports and special commentary from George Will, Michael Reagan, Ben Stein, Dr. Laura Schlessinger, David Limbaugh, Christopher Ruddy and many others.